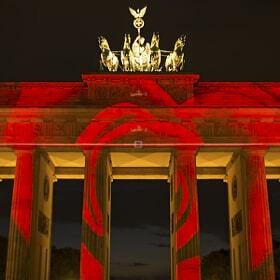 The Brandenburg Gate illuminated with a rose towards the end of the show of the "Festival Of Lights" in Berlin. (October 2014) At this annual Festival there are lightshows at a number of Berlin sights. 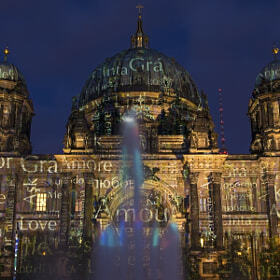 Festival of Lights: The illuminated Berlin Cathedral (Berliner Dom) towards the end of the "Blue Hour". 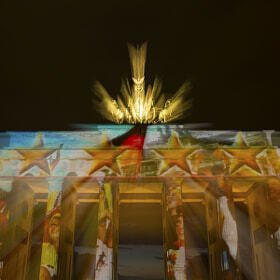 Illumination of the Berlin Concert Hall at Gendarmenmarkt (Konzerthaus, Schauspielhaus) during the "Festival of Lights" in October 2014 in Berlin. The Gendarmenmarkt is considered the most beautiful square in Berlin. 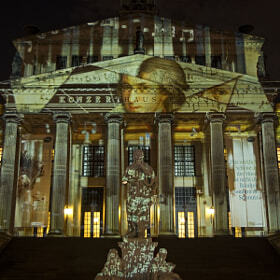 At this point of the light show also the statue of Schiller in front of the concert hall was illuminated. 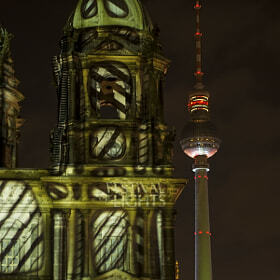 Festival of Lights: The illuminated southern tower of the Berlin Cathedral (Berliner Dom) in front of the also illuminated TV tower of Berlin (Fernsehturm). 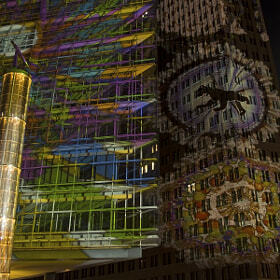 Festival of Lights: The lightshow at Potsdamer Platz, the modern center of Berlin. 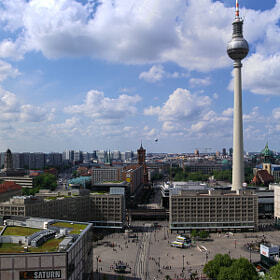 A second version of the High-Res Panorama of the Alexanderplatz square in Berlin taken from the former House of Travel ("Haus des Reisens") towards the West. Alexanderplatz was the central square of East Berlin. The TV-tower is a landmark of Berlin. I applied a very modest HDR-toning out of 5 images for each of the 6 vertically taken photos before stitching. I tried to keep the contrast. I think the result is a little bit more brillant than the first version. The two symbols of the East-Berlin city center at Alexanderplatz (Berlin, Germany) together. 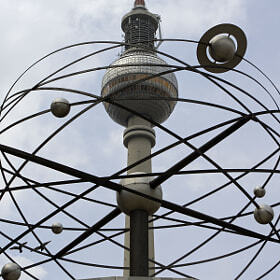 The World Time Clock as well as the TV Tower were landmarks of the East-German capital. 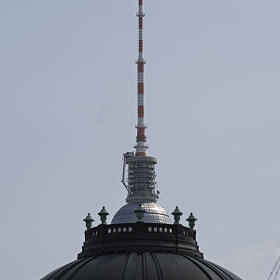 The TV Tower of Berlin (Germany) atop the dome of the Bode Museum on the Museums Island in Berlin. Tourist sights from a different perspective. 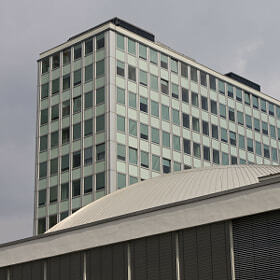 The so-called "House of the Teacher" at Alexanderplatz in the city center of East-Berlin rising above the "Congress Hall". Both building are examples of socialist architecture of the former GDR. 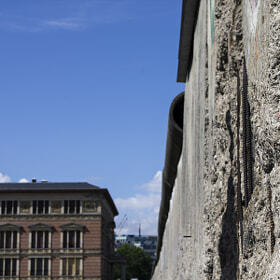 View of the preserved part of the Berlin Wall at the Topography of Terror exhibition. In the background the Martin-Gropius-Bau used for permanent as well as for temporal exhibitions. 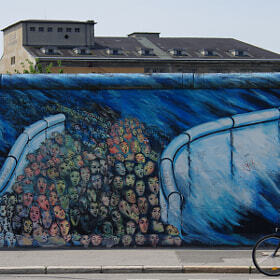 A snapshot at the East Side Gallery, Berlin. A biker is passing by a famous painting at the wall, displaying the opening of the wall. View from Friedrichshain /(east) towards Kreuzberg (west). In the background you see one of the two Victoria Magazines at the Kreuzberg port at the river Spree. This is a panorama taken from the roof of Block C of the Karl-Marx-Allee neoclassicistic buildings in Friedrichshain quarter, Berlin. 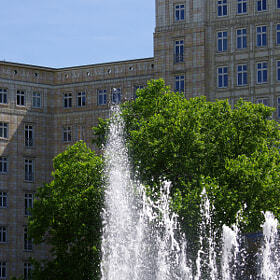 Built in the 1950's, the buildings of socialistic neoclassicism are today a landmark of Berlin, especially East-Berlin. They are under memorial protection and were meanwhile reconstructed.. 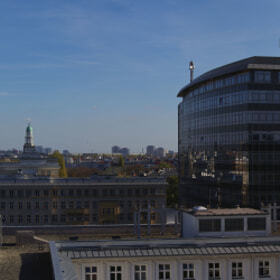 The block right of the center is a 1997 opened office tower of Allianz insurance and just behind it you see the "Tower Block of Weberwiese". It was the first socialistic building, constructed in 1951 in less than 200 days. Center left there are the two towers of Frankfurter Tor. In June 1953 the construction sites of the then called "Stalinallee" were the places were the june-revolt in the former GDR originated... 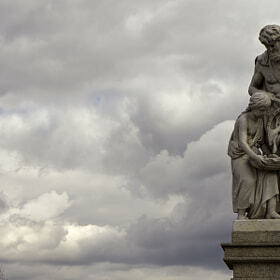 Note: This panorama was taken vertically (portrait) and stitched with the free software "hugin". It is originally slightly wider with a max. resolution of 15728x3469 px. One of my favorite photos.... It stands for 3 elements of Berlin: architecture, green & water. You could see it also as an allegory of time: history, season & moment. @ Strausberger Platz, Karl-Marx-Allee, Berlin. 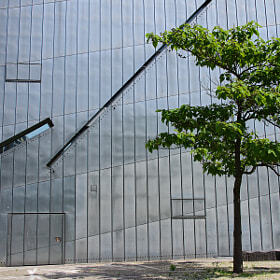 A tree growing in front of the steel-facade of the Jewish Museum in Berlin-Kreuzberg. 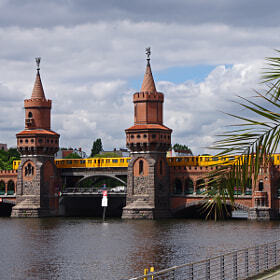 View of the bridge Oberbaumbruecke between Friedrichshain (East) and Kreuzberg (West) from a bar at the Universal building on the eastern side with a palm tree in the foreground. 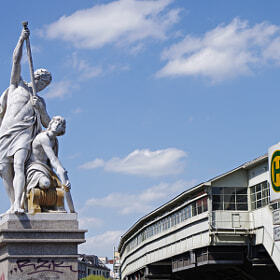 The allegoric sculpture "fishing" by Julius Moser is located on the bridge "Hallesches-Tor-Brücke" in Kreuzberg, Berlin.